I found this post, by A Teaching Life, to be particularly helpful. As we ended the glorious week of vacation that is Winter Break, I found this site and instantly loved it. This teacher shares her lessons and her ideas, and occasionally her own writing or inspirational pieces. I love it! I also like that she links directly to book information, which makes it easy for me to find, order, or link to other pages. I appreciate the extra effort. The pictures are nice, too! Since we don't compete with each other, I am so eager to learn from other teachers. What inspiring projects have they completed in class? What gets their students fired up about writing? How do they survive the day with 120 (or more) highly-hormonal and dramatic kids? If only our job were easy...but it's rewarding instead. 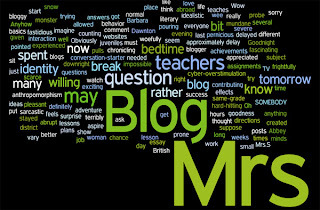 Mrs. S: So Blog, if I may call you that, how have you been? Blog: My goodness. Barbara Walters you aren't. You really should have started with a more hard-hitting question, like, "Do you worry that you are contributing to the pernicious effects of cyber-overstimulation in juveniles?" Mrs. S: Wow, that would have been a more severe question. A bit abrupt, but definitely a conversation-starter. Mrs. S: Anyhow, let's start with the basics, shall we? How long have you been chronicling the exciting life and times of Mrs. S? Blog: Am I allowed to comment on the presumptuousness of this statement? Mrs. S: I'd rather you didn't. Mrs. S: How frustrating that must be for you! I imagine that Mrs. S feels that her own identity, or job rather, pulls her in many different directions, too. Have you given any thought to your purpose? Blog: I aspire to be a place where Mrs. S can swap lessons, lesson plans, and literary achievements. She's a very idealistic woman, and is willing to try anything. You know she spent several hours over her break pouring over blogs and websites trying to get ideas for essay assignments over winter break? Mrs. S: You don't say. I suppose many teachers are prone to this behavior. 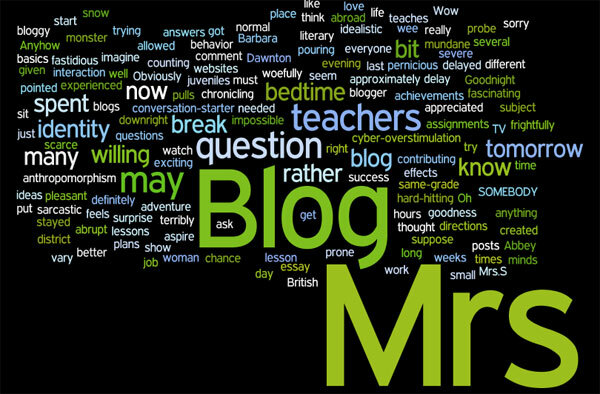 Do you think that Mrs.S is willing to put in the work needed for her blog to be a success? Blog: Oh, I believe so. Mrs. S teaches in a very small district, and interaction with other same-grade teachers is frightfully scarce. She would love to probe the minds of more experienced teachers. She'll stick to it, all right. Blog: I do. I spent a summer abroad in 2001. Blog: As you said, it's bedtime. Mrs. S: Argh, anthropomorphism at its sarcastic worst... Goodnight everyone, and have a pleasant (if not delayed) tomorrow. Okay, okay. It's going to really mess up my whole "finals" plan, but we very rarely get a snow day here in Southern Colorado! I'm very excited. I graded a whole period's worth of narratives, and I'm going to go XC skiing next to the river while taking pictures, then I'll work on my own story, retire to the couch, read an education-based book for an hour, and then let myself read a fiction (not geared toward young adults) for a little while, too. Brilliant! Sometimes, you redeem yourself, Winter. "Jason," I said sternly, "you need to sit down." He sauntered toward his seat, head down and voice muffled. "I don't want to sit there," he said, "Kaitlyn growls at me..."
The other kids laughed and giggled at this, his wittiest of remarks. Kaitlyn, a cheerful and brilliant young lady, looked at me with her hands raised in mock protest. I shrugged back at her, always apt to ignore some comments in the interest of denying clowns what they craved most - attention. The lesson continued and we broke into groups for a quick practice with "Intriguing Leads." I walk over to Kaitlyn, who is gently crying. Her partner sits accross from her, studying their paper and trying in vain to get Kaitlyn to ignore what is bothering her. "What's the matter?" I ask, and my mind races to the incident moments before. Her eyes are wet with tears. What have I done? "Was it the comment about you growling?" I asked cautiously. "I'm just having a bad day..." she began, "and that was just part of it."